90 miles, 4,700 feet elevation gain, 6 hours and change in the saddle. Today (day 7) was designed to be the longest, toughest day of the bike trip. Backroads had four different options from least painful to most horrific in endurance and climb. After riding in rain, headwinds and fighting off sand flies, I was getting used to torture. The Backroads Leaders painted a picture of a day that could be as challenging as you wanted it to be. One of them (Dana), possibly the most enthusiastic person on Earth, then exclaimed this morning that “You must feel so lucky to know that you are going to have the best day of your life!! !” Seriously, this is her world view. You have to be wired this way to be a Backroads Leader. They are some of the most competent people I have ever met as well as being among the most optimistic. It’s kind of their secret sauce. I on the other hand am most certainly not cut from their rarified cloth. What was I to do in the face of the boundless positivity? I was too tired to look for a gun so I put on my big boy pants instead on got on the road. In fairness, no one said I had to do the full monty of bicycling pain. There were numerous options that were much less intense. I had originally thought that I would do what many do and drop a leg, making the trip only 70 miles. Some would inevitably (and smartly) opt for even less than that. Instead, I decided to adopt a strategy where I would simply see how I felt at the end of each of the four legs and go from there. While I have spent much time on a bike saddle in my life, it has generally been for 45 minute workouts, 50 minute spin classes, and 90 minute quick/fast road rides. I have never ridden this far or this long, nor have I ever thought of myself as an endurance athlete, hence my trepidation on what would be a very big day for me. 1. Haast to Pleasant Flat: 46 km with flat terrain with periodic rollers. We started at 8:30 AM and were off to the races. It was still a little chilly on the coast, but there was much more to focus on than the temperature. We were still on the west of the mountain range close to the West Coast and Tasmin Sea. I was reminded one last time of the uniqueness of this part of New Zealand where you can see rain forest and snow capped mountains all at the same time. 2. Pleasant Flat to Makarora: 34 km including a 10 km climb over the Southern Alps pass known as Haast Pass. This pass has a long history as a trading route for the Maori coming from the coast to trade with the interior towns. It is now known as a very, very steep hill for cyclists and for good reasons, particularly a 2 km 15 degree climb. Ouch. I knew I would do this leg because I would consider myself a big wimp if I didn’t. The pass itself is a little anticlimactic as it is in the midst of a bunch of trees, however, they do have a fairly tiny celebratory sign to mark the victory of the climb. Better than the sign was the way-fast downhill that barreled me into the town of Makarora. Haast Pass in all of its glory! 3. 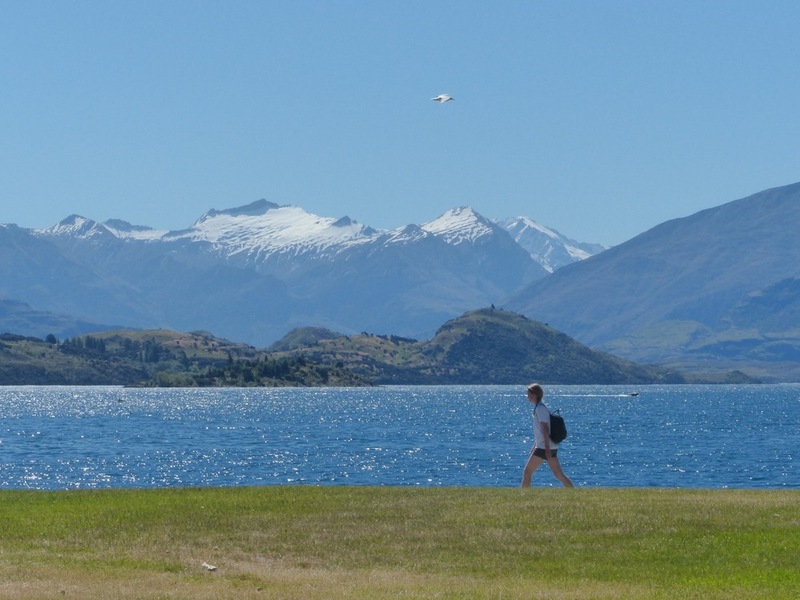 Makarora to Lake Hawea Lookout: 36 km with many, many, many hills. I kind of had to do this one as the scenery was supposed to be mind blowing, and I was feeling pretty good even after the big mountain pass climb. In truth, the scenery was indeed disturbingly beautiful. 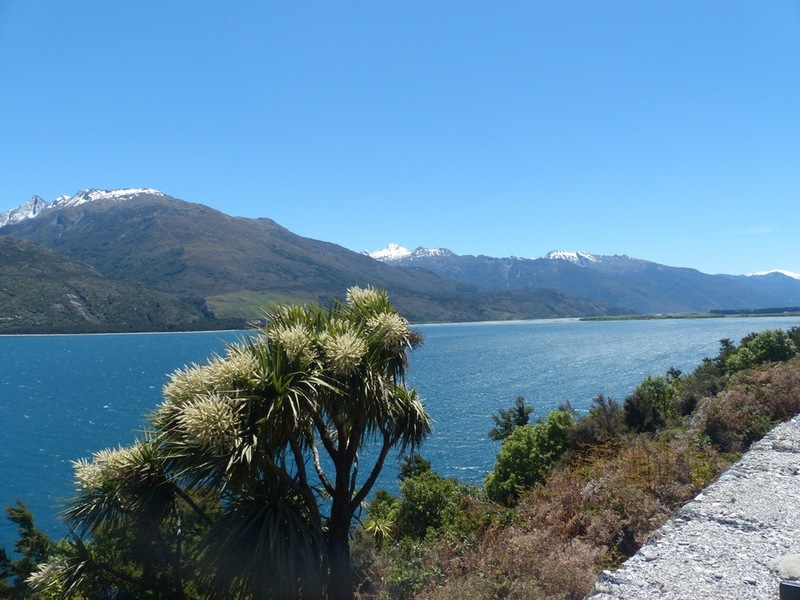 It gave the first view of Lake Wanaka followed by Lake Hawea, both large, freaky blue lakes that sandwich the road. Rose bushes, sheep, mountain flowers, and beautiful vistas abounded. At one point, I was so overloaded by the beauty of it all that I seriously considered stopping my bike and weeping. Ride-wise, there were two particularly nasty climbs at the end, and I would have been justified throwing the towel. Oddly, I was starting to feel more energetic, not less. Weird. 4. Lake Hawea Lookout to Wanaka (destination): 30 km with rollers including a couple that just bugged me to no end. At this point, I had to go the full distance. I still had juice in my legs and my body was much less sore than I thought would be the case. My cycling buddy and I arrived just before 4 PM. I don’t think either one of us had much left, but we were both in a surprisingly good shape. And yes, Dana, it was one of the best days of my life. It was certainly the best cycling day.